The past week was full of relaxation and exciting news. 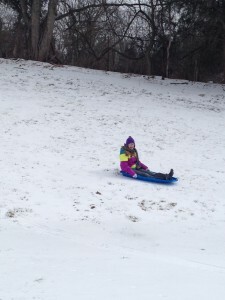 As I write this I am on my seventh snow day due to ice and snow that hit Nashville last week. 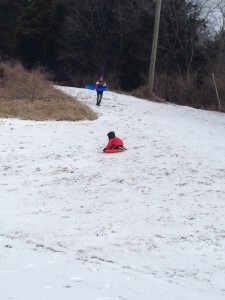 The last of the ice simply won’t melt, and Nashville’s not equipped with plows and salt trucks like Northern cities are. Let’s hope I get to go back tomorrow. The family was out of school last week, too, and we spent a lot of days indoors, watching TV, streaming Netflix (I finally finished the Gilmore Girls series), playing games, exercising, and reading. We did get to go sledding one day, which was a blast. We ventured out to the eye doctor on Thursday, and it is official: Ephraim needs glasses. Now all four of us are 4-eyes. But glasses seem to be hip nowadays, so I guess we’re cool. I am happy to report that I have also gotten around 6,000 words written in the past week. I was hoping for 10,000, but I have a total of 43,000 words at this point, which should be over the halfway point for a YA novel. I have tried to sit down and write poetry, too, but the words just haven’t come. I actually have plans to contribute to a new website about faith and belief outside the borders of church. I should have turned in a piece a couple of weeks ago. But it seems like right now I just can’t find anything to say when it comes to faith. 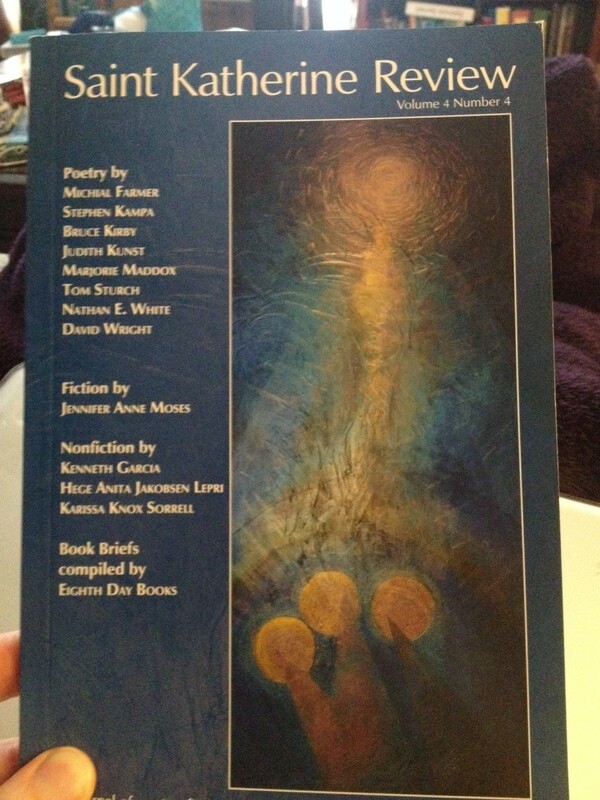 That said, this week my contributor copies of St. Katherine Review came in the mail. My essay on miscarriage, titled “Embers,” was in this issue. Oddly enough, the timing is right around the two year mark. Two years ago, I had been to the doctor for a 10-week ultrasound, and all they found was an empty sac. We waited a week and checked again, but there was nothing there. I had been pregnant for a short time, they told me, but the baby just stopped growing. I had a D & C early in March of 2013. There is a life-fire within me that once created two beautiful children. Now it just singes my insides, making my womb, my heart, black as stone. I gather my strength through writing. I recover my voice, and it is the voice of a woman. I hear my empty womb, which speaks to me from deep within the ashes, and tells me I am a light that can never be extinguished. I also got two pieces of good writing news last week. 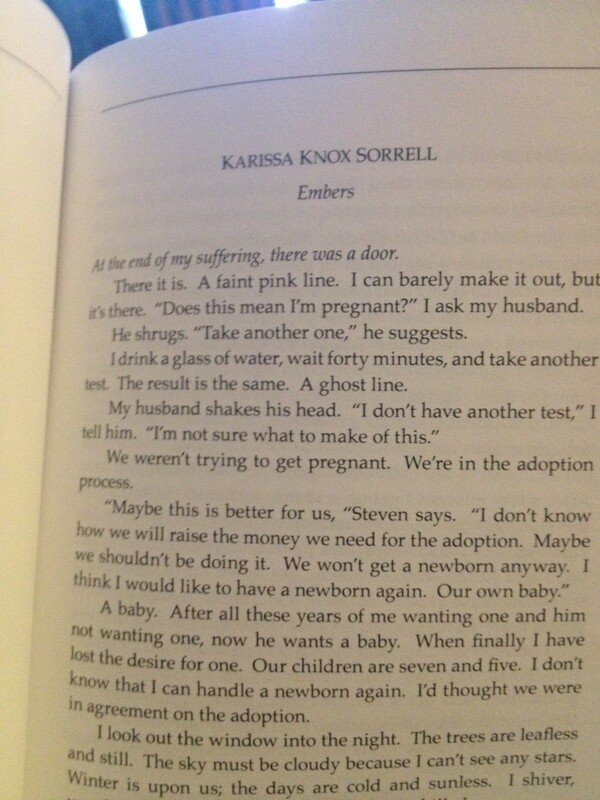 A long time ago (like over 2 years) I had an essay accepted to an anthology called Soul Bare, which is more or less about being authentic and open about faith and doubt. At some point, emails about the book stopped coming, and I figured the whole project had just petered out. But last week I got an email from the Soul Bare editor that said that she’d withdrawn the project from the original publisher and had secured a literary agent who is excited about the anthology and is pitching the piece to some big-time publishers! My essay, “Wrestling with God in the Arthouse Theater,” will be one of the pieces in the book! It is about the movie Tree of Life, and death, and grief, and Jacob in the Bible, and an angel in disguise – well, at least a kind hearted soul – I met in the theater bathroom. I hope the essay won’t be too outdated since Tree of Life came out a few years ago now. 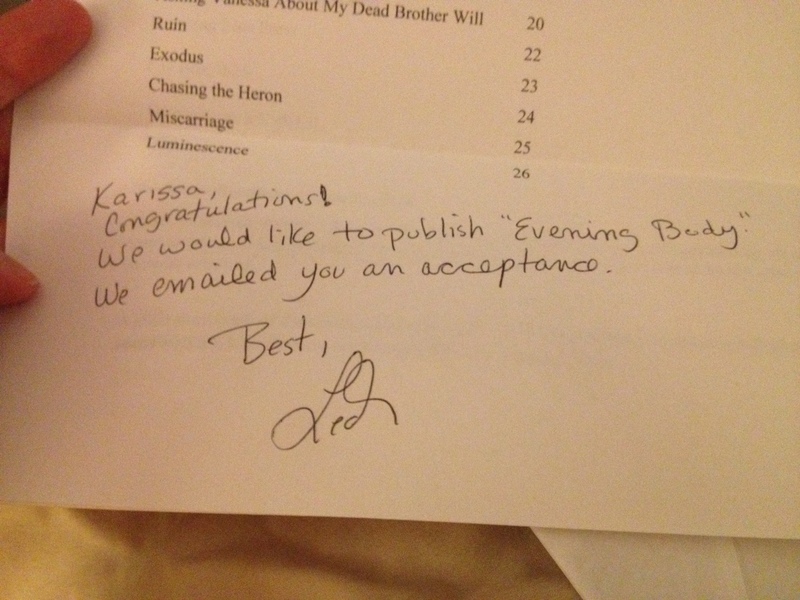 Lastly, I received a poetry chapbook acceptance from Finishing Line Press! My chapbook is titled Evening Body, after a poem I wrote with the same title about winter trees, and fragility, and the body. (You can read it here.) Strangely enough, this is what my MFA creative thesis was titled, and I never thought I’d actually go with that when it came to publishing a real chapbook, but it turns out that that poem is still a favorite of mine, and I felt like it was a good overarching title for the book, which has a lot of nature poems. A few of the poems in the chapbook were written while I was getting my MFA, but many are newer. Finishing Line Press does press runs dependent on pre-orders, so that is the only thing I’m a little unsure about, but keep your eye out for a little giveaway I’ll be doing on the blog eventually for anyone who preorders my chapbook! I want to thank all of you readers who have supported and encouraged me over the years! Also, my husband’s basketball team has made it to the state tournament for the first time EVER! I am not a big sports fan, but I have to say I have attended some pretty amazing games lately. His team is doing fabulous and working hard. There is another game to go on Friday, and if they win that, they are in THE state championship game on Saturday! 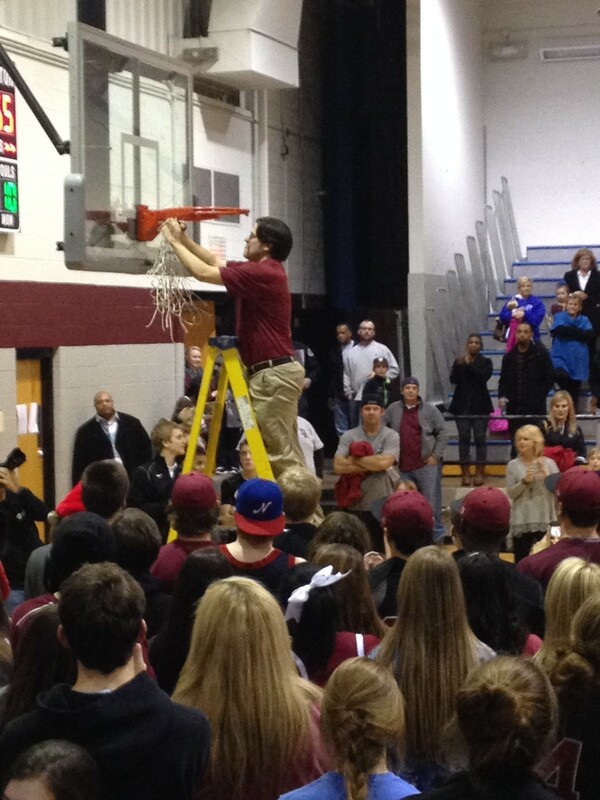 I cannot explain this strange tradition, but that is my husband cutting the net after a big win. The only thing that could have made last week better is if Steve Carell had won the Oscar for Best Actor in Foxcatcher. Oh, and if Sean Penn hadn’t made that stupid green card joke. Oh well. I guess you can’t have everything. Wow! You have really been productive. I am so happy for your success. Congratulations! What a fun news-filled post! 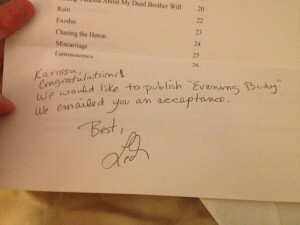 I’m so excited about all your writing and publishing news, Karissa. 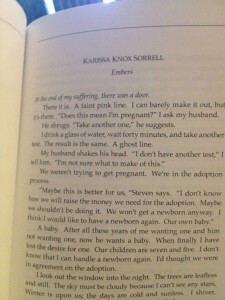 A chapbook, an essay in an anthology, and a novel-in-progress… you go, girl! It’s always inspiring when a fellow writing is being so diligent and seeing some fruit from that diligence. Kudos! Thanks, Susan and Susan! It’s nice to have big news to share.